Olive + Oak's Morgaine Segura thanks her parents for her love of cocktails. To say that Morgaine Segura's parents inspired her love of cocktails is an understatement. They actively cultivated it. "My parents have always been fairly liberal as far as drinking goes — as young as eight, they thought I was old enough to start trying things with them," Segura recalls. "My dad did sommelier classes, and he would bring back what he tasted and have all these spices laid out on the table, and we would have to pick out what we smelled. That's just how I grew up. We were allowed to enjoy it, and it wasn't an issue." Looking back, Segura seems destined for her current role as bar manager at the wildly popular Olive + Oak (102 W. Lockwood Avenue, Webster Groves; 314-736-1370). It wasn't just that her parents encouraged her to smell and taste; they raised her to approach making drinks in the same way as cooking, viewing spirits like any other ingredient. Even at an early age, she would ask to make their drinks for them. It's how she perfected her negroni. "To me, it was like cooking, following recipes and paying attention to what flavors were going on," Segura explains. "Spirits were never some contraband I had to sneak off and chug." But it wasn't just at-home cocktail creations that helped shape her career path. Segura often found herself accompanying her mother, a local cocktail connoisseur and influencer nicknamed the "Cocktail Ambassador," on photo shoots and drink events at some of St. Louis' top cocktail bars. Though Segura did drink nothing but water and sit quietly alongside her mother as she worked, she observed everything the bartenders did. Eventually, she began asking questions, and when those same bartenders showed up at her parents' parties, they helped guide her burgeoning interest. Segura did not pursue bartending as a career right away, though. She went to college in Vermont where she studied political science, history and English. She became active in Vermont politics and, though she worked at a beer bar, she envisioned herself pursuing full-time work in local government after graduation. Instead, Segura found herself in Brooklyn, New York, where she worked for a travel company that did tours to destinations like Cuba and Iran that were typically off-limits to Americans. Though she loved what she was doing, she realized that she could not afford New York and moved back to St. Louis to reset. It was a move that would prove fateful. "I had no money, no car and no place to stay, so I moved back in with my parents, who lived in the Skinker-DeBaliviere neighborhood," says Segura. "I needed a job somewhere that I could walk to, so that's how I ended up at Moonrise." Segura was hired as a bar-back at the Moonrise Hotel, where she learned the art of the cocktail from some of the city's top bartenders. 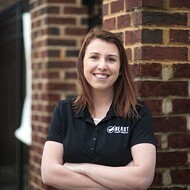 She began to understand the difference between being a professional bartender and a cocktail enthusiast, and she decided she wanted to pursue the trade full-time. 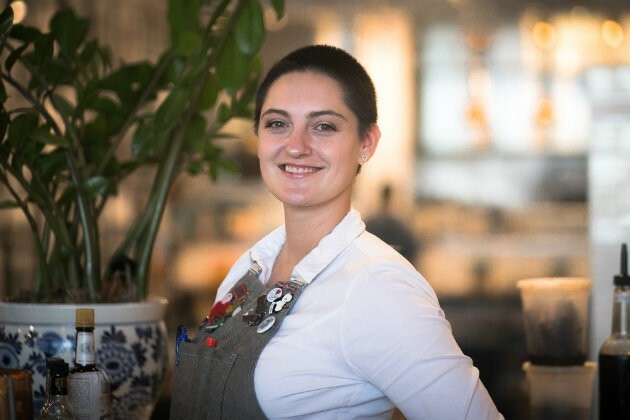 Now, as bar manager at Olive + Oak, Segura is getting the chance to show off what she's learned at one of the city's premier restaurants — alongside her fellow bartender and husband, Charlie Martin, whom she met while working at the Moonrise. "It's not even work anymore; it's just fun," says Segura, calling owner Mark Hinkle "the best boss." She adds, "I get to come in and experiment, and there are so many regulars. It's just fun every day." Though professionally satisfied, Segura hasn't left behind the part of her that wanted to pursue government and the humanities. In fact, what she has learned about bartending over the years is that she doesn't have to abandon anything — that being behind the bar provides enough of a context for her to explore both interests at the same time. "All these fields are intertwined, in my opinion," Segura says. "I feel like I don't have to choose — that I can bridge everything together, and I'm really excited to do that. I'm fusing everything I have done my whole life." Segura took a break from the bar to share her thoughts on the St. Louis food-and-beverage community, her love of Topo Chico and the special ingredient at the heart of her wedding "cake." I don’t know. Honestly, I’m pretty introverted, so I want people to know less about me! So that might be something I want people to know: I’m introverted— that doesn’t mean I don’t love speaking with people (I wouldn’t be very good at my job if that were the case) but I am best able to replenish my energy when I’m alone. I feel there is a real misconception of what it means to be an introvert. Many great bartenders I know are introverted — they drain themselves every day for their customers' benefit. Once the introverts clock out, it’s time to sit silently somewhere (like Taste, where I am right now!) and enjoy the sounds of other people chatting. The alcohol helps, but I will never feel comfortable reaching out and making the first effort. It’s hard! And intimidating! But always worth it. I am horrible at ritual! The only thing I can do consistently is brush my teeth. On the other hand, one of my cats, Averna, is all about habit. There is always a point in the morning that she comes and lays on my chest and we cuddle. I think, for her, that is non-negotiable. The ability to pause time. It would be so nice to stop the clock and squeeze in a nap every once and a while. St. Louis is a budding city, especially in regard to food and beverage. It’s been awesome to see people starting to take risks over this past year. That’s how we grow as a community. I’m so impressed with people like Tim Wiggins and the Retreat crew for opening Yellowbelly, and Ely Logan with Savage. These people are out there doing what is important to them and trusting the other members of the community to support them, even if their concept is a little more adventurous than other places in St. Louis. I’m also loving the degree of collaboration in St. Louis right now. I recently attended Alex Salkowski’s Young Blood dinner at Good Fortune — what a fun idea! I love that we aren’t competing with each other but celebrating each other’s talents and bringing young professionals into the spotlight. It feels like we are all lifting each other up. Late-night food. This city shuts down so early, and I’d love to have a few places that serve awesome food late-night. I love going to the Gramophone, but I can only eat so many sandwiches. This one’s easy: Charlie Martin. I am so grateful to have the opportunity to work with such a dedicated and uplifting industry professional. Charlie is the one who really got me excited about creating cocktails and being a part of this community. It’s a privilege to have worked with him at Eclipse, and I’m certainly lucky he followed me over to Olive + Oak. Loryn Feliciano-Nalic, no doubt. Balkan Treat Box is the best food in St. Louis right now. I am so excited that they will be opening up a brick and mortar right down the street from Olive + Oak! I could eat a pide every day and never get tired. Loryn and her husband Edo are some of the kindest and most humble people. Amaro. It is an ingredient that has so many different expressions. I can totally relate to that. I am always growing and changing, not dissimilar to the Amaro Charlie and I recently made. Depending on the proof of the spirit, the ingredients added, and many other factors, the taste of the final product will be so different. I also feel I am a good “modifier” that can fill in and bring something unique to any situation. It's finding itself. It seems like there are a lot of restaurants opening and closing right now. Consumers are figuring out what they want to support. We're in our early twenties, experimenting and failing a lot — but always learning from our mistakes. I had a long talk about this recently with Angela Ortmann and Holly Nickels Fann. St. Louis has just graduated college and is now deciding what it wants to do with its life, pulling what it likes from the big cities and tweaking it to fit its own lifestyle. It’s a pretty awesome time to be here. We are paving the way to a more unique food-and-cocktail scene every time we walk into a bar or restaurant. Whether we’re working or just dining, all of our decisions are changing the climate. What we’re not ordering is just as important as what we are — we’re weeding out the mundane and bringing something uniquely St. Louis to the table. Special-effects makeup. Makeup is my side hustle right now, but I’d always like to do more. Other than that, I’d like to spend more time planning and executing private events or small, in-home cocktail dinners and classes. Writing has always been a passion of mine, and I’m always looking for an opportunity to write more. My initial reaction is to say flavored vodkas. If I had a choice I would have no vodka at all, honestly. But there is a time and a place for everything. I guess I’d say there is no room behind my bar for a negative attitude. We are there to provide a fun and positive experience; personal issues should not get in the way of that. We often go to CJ Muggs or Llywelyn’s in Webster when we get off work. It’s a good time to reflect on our service and bond with people over a shot and a beer. If we leave work early enough, we will try to hit Taste, Mission Taco Joint or Gramophone. I don’t really feel guilty about enjoying anything. I could survive solely on Topo Chico and charcuterie. I had Wendy’s for the first time the other day and I guess I felt pretty guilty after eating that Baconator — but more like I just needed a long nap. Cheese! I love charcuterie, and a giant meat-and-cheese board, like the one at Acero, would certainly be my last meal. Parker’s Table also has a killer selection of cheese. They actually made my wedding cake, which consisted of 45 pounds of cheese stacked a foot high and filled in with meat flowers. I would be drinking Topo Chico and shots of tequila would be interspersed through the meal. As far as wine goes I’d drink Von Buhl Sparkling Riesling, Robert Sinskey Vin Gris and the Field Recordings Petit Syrah. I’d finish strong with a Civil Life Brown Ale and a Ferrari (the beautiful combination of Fernet Branca and Campari).